Though I might malign zucchini for its propensity to overtake every possible kitchen surface, I must commend any vegetable that can produce a dessert as intensely chocolaty and gratifying as these whole wheat zucchini brownies. Let us give respect where respect is due. These fudgy squares of hidden-veggie magic are downright delectable. This zucchini brownie recipe came to be when my hankering for chocolate intersected with my perpetual, internal guilt over allowing produce of any kind to go bad, including excessively abundant squash. Our zucchini were just about to slip into the no-zone, when I remembered a pan of zucchini brownies that I made for Ben and myself a few summers ago. They were terrible. A recipe that turned out badly might sound like odd motivation, but I was convinced that zucchini brownies could and should be delicious. I loved this Chocolate Chip Paleo Zucchini Bread after all, so surely zucchini brownies had potential. I began to fantasize over my ideal zucchini brownie. Totally normal. My zucchini brownies were to be fudgy but not too fudgy to resolve the household conflict between the fudgy brownie loyals (me) and the cakey brownie devotees (Ben). They needed To be quick and easy to make, as I don’t like anything standing between me and my brownie, least of all extra prep time. 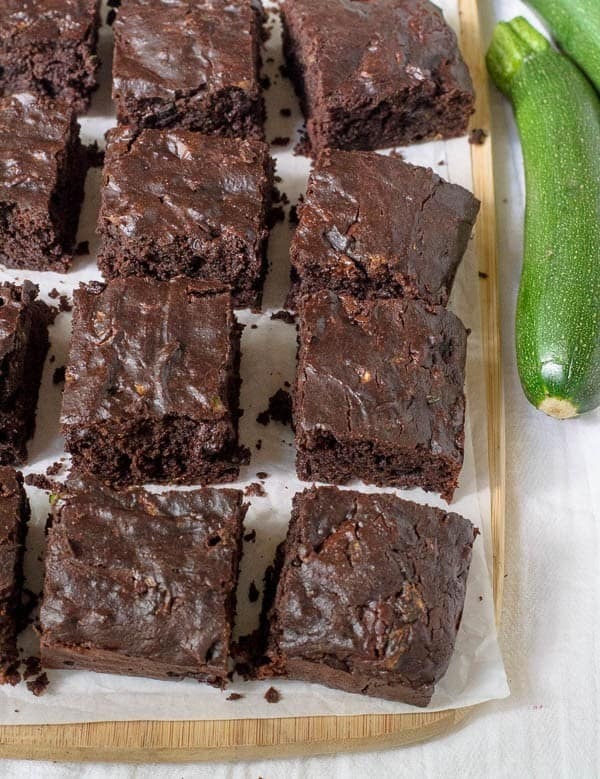 Finally, to properly honor the reality that we are, in fact, putting vegetables in a dessert, I wanted my zucchini brownies to be reasonably healthy…without actually tasting healthy. A few recipe tests later, and we have a victory on all accounts. Zucchini brownies, I knew I liked you. These brownies are 100% whole wheat, sweetened with maple syrup, and boast two full cups of shredded zucchini. They pack double the chocolate—cocoa powder or dark chocolate alone did not seem sufficient, so I used both—and are ultra moist, thanks to a combo of coconut oil and the moisture from the zucchini itself. And, just in case you were worried, they don’t taste vegetables. At all. This recipe was my starting point, and after a few rounds of tweaking, I arrived with what I consider to be my ideal zucchini brownie. I added a bit of nutmeg, replaced the original olive oil with coconut oil, and, because I found the taste of the honey used in the original recipe to be a bit off-putting with the chocolate, my final version uses maple syrup instead. It gives a more classic brownie flavor and is a nicer pairing with the cinnamon and nutmeg. 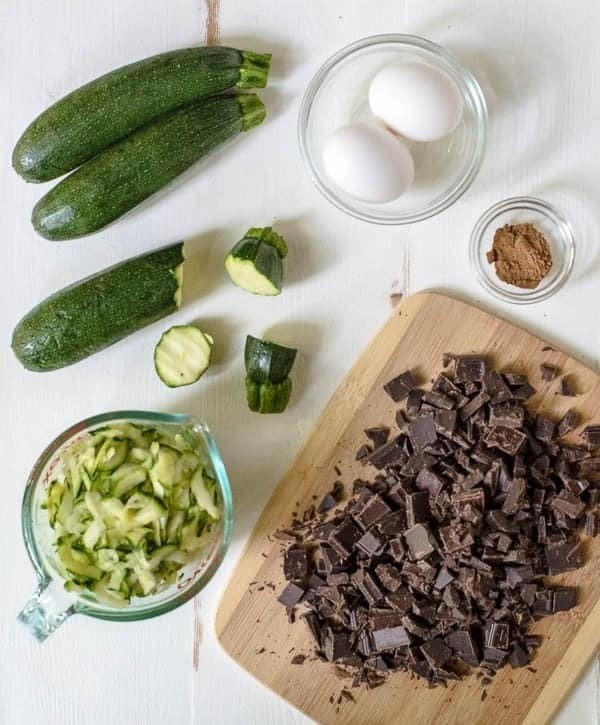 Two additional tips: First, be sure that you don’t completely press the zucchini dry after grating—you want most of its moisture to make the brownies nice and moist too. A light pat should do. Second, these brownies are not ultra sweet, so if you aren’t a fan of especially bittersweet chocolate flavor we can’t be friends choose a semi-sweet (around 55% or 60%) chocolate, versus a more intense 70%. Public service announcement: I’ll be cooking LIVE on Evine TV’s The Sizzle this Sunday, around 9:25 a.m. CST, demoing this pan. If you’d like to tune in (and watch me try not to burn fish tacos), you can find a channel guide here or watch live here. Moist dark chocolate zucchini brownies made with whole wheat flour, coconut oil, and maple syrup. So decadent, you'll never suspect they're healthy! Place a rack in the center of your oven and preheat the oven to 350 degrees. Grease an 8 x 8 inch baking pan and line with parchment paper so that you have a little hanging over the sides. Grease parchment paper a second time. Set aside. Grate the zucchini, then lightly pat a paper towel to remove some excess moisture. Do not dry the zucchini out completely. In a large mixing bowl, beat together the coconut oil, eggs, maple syrup, and vanilla. Add zucchini. In a separate bowl, combine flour, cocoa, salt, baking powder, cinnamon, and nutmeg. Stir to combine. Add dry mixture to the wet/zucchini mixture. Stir to combine. Add chocolate chips. Bake 30-35 minutes or until a toothpick inserted in the center comes out mostly clean but with a few crumbs still clinging too it. Let cool completely before removing from pan with the parchment paper handles…or take your chances. Love tha these are naturally sweetened and OBSESSED with the photos on this post! :) That shot of the mixing bowl! Zucchini + chocolate is just the best. These brownies sound so good – I’ll take one for breakfast please! Have a great weekend Erin! Just any kind of maple syrup? Is there a brand that you prefer? Great question Tami (and I added notes to the ingredients!) ALWAYS pure maple syrup, and when I can find it, I prefer Grade B, because it has a richer flavor. If you live near a Trader Joe’s they make a great big Grade B bottle that I love, and it’s a good value too. Hi Erin – I’m with you when it comes to throwing away good food, though it’s tough to keep up with zucchini since it grows like weeds. 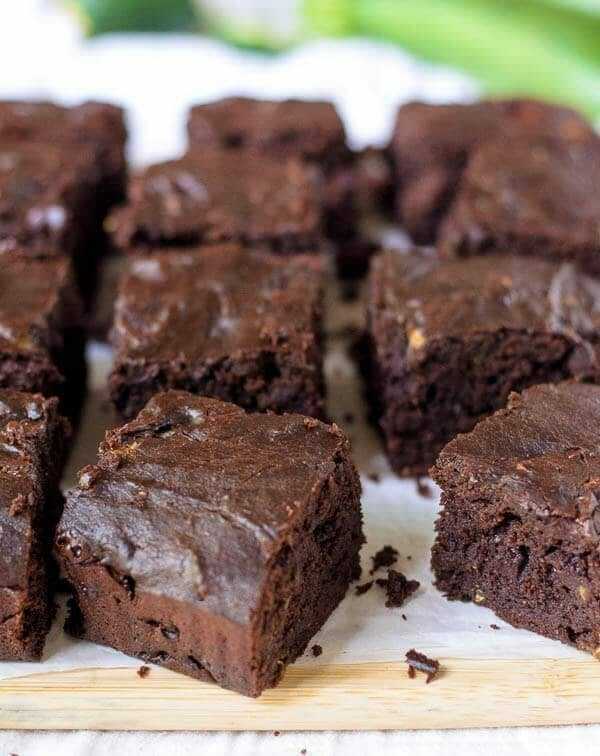 Your brownies are definitely a nice change from zucchini bread! Praise you for making brownies that aren’t loaded with extra sugar and butter! I’ve never had zucchini in brownies before. I’m glad yours turned out better this time! I’ll definitely have to give these a try. Gorgeous pics! Healthy + zucchini = YUM. These look pretty tasty and can’t wait to try them! 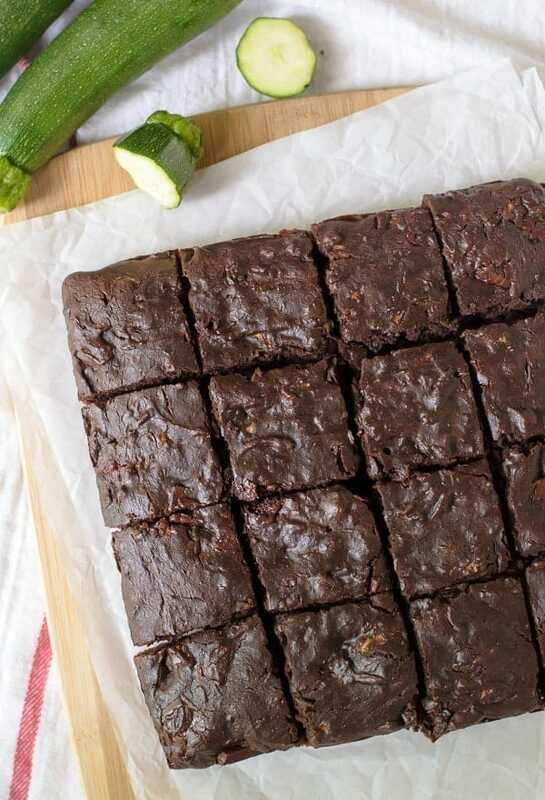 Zucchini + brownies, definitely go perfectly together. Such a delicious treat! Pinning! 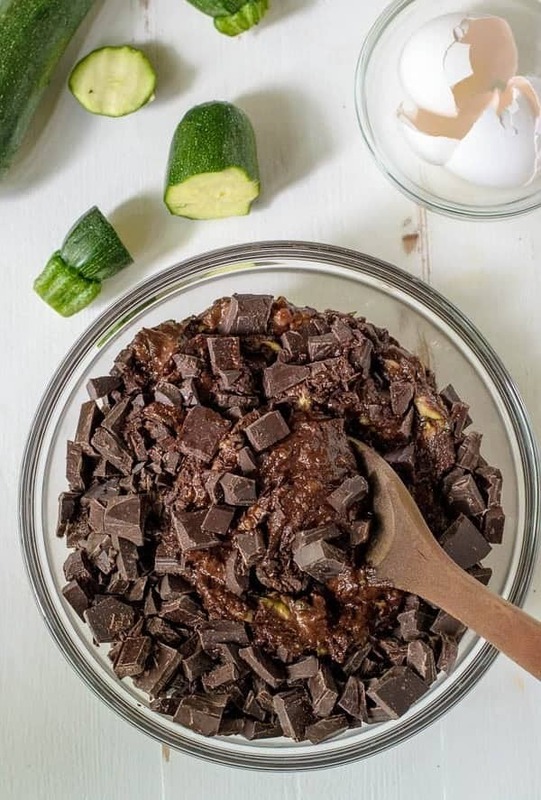 I love this Zucchini + chocolate combo. It is so good! These brownies looks absolutely delicious. so good!! Have a great weekend Erin! Looks great! Any thoughts on a gluten-free substitute for the whole wheat flour? Hi Michele! I’ve never done a gluten free version of these, but I have had success in other baking recipes using Bob’s Red Mill’s 1:1 Baking Flour Gluten Free Substitute. You can simply replace the whole wheat flour with the same amount of the 1:1 blend. Again, I’ve never tried it for this recipe, but if you want to experiment, I think this would be a good place to start. Zucchini in any dessert is *two thumbs up* in my book. And these look heavenly!!! I saw the comment above about making them GF. Oat flour labeled GF (Bob’s Red Mill) works really well in brownie recipes. These look amazing. I don’t know if I could live with a cakey brownie devotee, so you have my utmost respect, Erin. These are a great way to make everyone happy! These look fantastic!!! I’ve been looking for a healthy brownie recipe for my kids. Very excited to make these! I need to make these immediately. Tell the truth, can you taste the coconut if you use coconut oil? Oh yum! I have a large zucchini that I’d love to turn into brownies! Yum! Zucchini brownies! I’ve made SO much baked goods with zucchini before but never thought to make them into brownies. These are wonderful, Erin! do you know how long can I keep these in the fridge ? Hi Maria, they’ll keep a few days in the fridge. You can also freeze them tightly wrapped in plastic for 1 to 2 months! Made these last night for my picky and skeptical eater with full disclosure about the zucchini. Verdict was that they were good. High praise for anything involving squash from him, trust me. I think they turned out great. Loved the trick with the parchment paper. Made cleanup a breeze. We have a winner, Thanks, Erin. Amy, I am so, so happy to hear this, especially since they won approval from a veggie skeptic. Thanks so much for trying the recipe and letting me know. Have a great day! Can agave be used instead of syrup? Great question Rebecca! The texture of the brownies will turn out just fine with agave, but they will be more bittersweet. Maple syrup was the taste I preferred, but if you enjoy especially bittersweet flavors, then go for the agave! So do you use the nutmeg in the ingredient list?? I apologize for this miss! I’ve updated that in the directions now. Thanks for letting me know! Hi Erin, I stumbled on your blog and was awed by all the healthy yet fabulous looking recipes :) wondering if you use a fan oven or conventional oven? Want to take care not to over-bake these brownies! Cheryl, welcome!! I’m so happy your found my blog. I write all of my recipes for a conventional oven. If you want to use a convection (fan) oven, then I recommend referring to your manufacturer’s directions for how to adjust the temperature/baking time. I hope you love the recipes you try! Is another word for the flour “00” (double zero)?? Not self raising? Hi Tracey! 00 and “double zero” are the same. Self-raising flour is flour that has a leavening agent already in it. I hope that helps answer your question! Yes I know that. But I’m trying to figure out what this recipe uses!! Tracey, the recipe uses whole wheat pastry flour, as listed in the ingredients. I included a link so that you can see the product in the ingredient list too. It’s neither double zero flour, nor self rising flour. If you can’t find it, simply swap all purpose flour. I hope that helps! Definitely Tracey! I’d wrap them tightly in plastic wrap, then put them in a zip top bag. You should be able to freeze them this way for 1 to 2 months. I hope you enjoy the recipe! It was a real hit..
I’m so happy to hear that Tracey! Thanks for letting me know. Do you have nutritional content for these brownies? Hi Tamara! Regarding nutritional info, this is something that I’ve actually started adding to all of my new recipes, effective January 2016 (you’ll see it in the recipe box at the bottom). Unfortunately, it’s pretty time consuming, so I’m unable to go back and add it to past recipes. If you’d like the nutritional info for any of my older recipes (or really any other recipe or food), you can actually calculate it yourself for free at myfitnesspal.com (this is how I calculate the new recipes on my blog). I’m sorry I can’t give you the information for this exact recipe, but I hope that My Fitness Pal will be a helpful resource for you. Thanks. I will try that. The brownies were very good! Yay! I’m so glad to hear that Tamara. Thank you! I am eating one of these right now. I didn’t change the recipe at all and they are so fudgy and GOOD!! I used maple syrup from my back yard-bonus! Kim, I am so happy to hear you loved these so much. I bet that maple syrup is OUTSTANDING. Thanks for trying the recipe and leaving your review! Just made these and they were amazing! We put the ingredients into myfitnesspal, and came up with 208 calories, 10 grams of fat per brownie. Thanks for your blog. HOORAY! I’m so excited to hear that Robbie. Thanks for sharing your review, and the nutritional info too. I made these for a friend who swore he would never eat zucchini again. He said he would have eaten zucchini all along if it had been in treats this good! Then I turned around and substituted freshly roasted pumpkin for the zucchini and that got rave reviews also. This is my new favorite brownie recipe. Thank you so much! Ruth, I am so happy to hear this! Nothing like a brownie to convert zucchini skeptics :) That’s great to know that the recipe works well with pumpkin too. Thanks for sharing! I don’t think we have pastry flour in the UK, is there anything I can use as a substitute ? Hi Leyla! You can use all purpose flour or white whole wheat flour. I hope you love the recipe! I’m not a huge fan of cocoa powder. Any substitute suggestions? Hi Stacy, the recipe was developed and tested using cocoa powder, and there isn’t a way for the brownies to come out without it. I’d suggest my Paleo Zucchini Bread or Zucchini Muffins with Chocolate Chips if you’re looking for something without cocoa powder! Thanks, I appreciate it Erin. I will check them out. Could you add nuts to the recipe? What would one have to do differently to accommodate for them? Hi Steph! You don’t need to do anything differently. I’d chop and toast the nuts first for maximum flavor, then just fold them in right along with the chocolate chips. About 1/2 cup of nuts should be perfect. My coconut oil is organic and makes everything taste like coconut :P. Would that still taste good with the cinnamon and nutmeg? Also, can I use rice flour instead of all purpose flour? Hi Miriam, it’s really up to your personal preference whether you’d like a coconut taste in the brownies! To be safe, you can use canola oil or another more neutral-tasting oil instead. I have never tried rice flour in this recipe, and since it behaves very differently than wheat flour, that swap would be a major experiment. I think a 1:1 gluten-free baking blend should work, but I’m not sure how rice flour would turn out. Lucy, I am sorry you didn’t enjoy these! What % chocolate did you use? Also, I did find that the honey has an off flavor with chocolate and could be why you aren’t enjoying the taste. I’ve made them both ways and do prefer the maple syrup. Now that the brownies are baked, I’m afraid you can’t do too much. Maybe try serving them with something sweet like vanilla ice cream and/or a chocolate sauce?